When Grace Taskinsoy of Fountain Hills, AZ learned that she had dyslexia, she vowed to make a difference. The then 9th-grader started a blog, posting information to help other students with dyslexia. 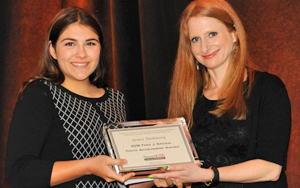 But it’s what she did next that has left a lasting impression—and explains why she is the 2016 Smart Kids Fred J. Epstein Youth Achievement Award winner. In 11th grade, Taskinsoy volunteered to work with a law firm that was spearheading legislation to support children with dyslexia. “I sat in on the language revision of the bill, and met with State Senator Kelly Ward to talk about why I supported the bill and why she should support it, too,” said Taskinsoy. In addition, she testified before Arizona’s Senate Education Committee about her own experience, and wrote email blasts to parents of children with dyslexia, urging them to support the bill. Taskinsoy’s learning difficulties weren’t always obvious, and in fact, were missed by all her early teachers. It wasn’t until middle school that it became clear something was amiss. In elementary school she was able to excel because so many activities involved hands-on learning. But by middle school, she began to have trouble coping with the amount of material required and more frequent tests. When she almost didn’t graduate middle school because of her grades, Taskinsoy decided she had to make a change. She entered a lottery to attend Scottsdale Preparatory Academy, a small charter school with a demanding liberal arts curriculum. It was there that her teachers noted her test grades didn’t match the high grades she received for classwork. The school’s dean met with her parents and suggested that the ninth-grader be evaluated for dyslexia. The evaluation found Taskinsoy was twice exceptional: She has a learning disability (dyslexia), but she also has areas of extreme strength, making her gifted as well. At first Taskinsoy used accommodations recommended in the evaluation, but before long she developed her own coping mechanisms. For example, she often studied for tests with her mother, using a whiteboard to create timelines and sketches. Thus, to remember details about the “Red Baron” (a German fighter pilot in World War I), she would draw a plane next to his name and write facts about him in the same color as the picture. She loved reading Shakespeare, citing Macbeth as her favorite. “I guess my brain works better when there are different characters rather than a huge plot summary,” she commented. Following her diagnosis Taskinsoy started doing better in school. That’s when she started her blog to make it easier for people with LD to find information in one place rather than search on many websites. As for the future, Taskinsoy said that being involved in the legislative process in Arizona sparked her interest in politics. In the short term, this fall she will attend DePaul University’s Driehaus College of Business in Chicago and plans to major in international relations and business management. Rose Horowitz is a Pulitzer-nominated journalist who is a public relations and communications/social media expert.